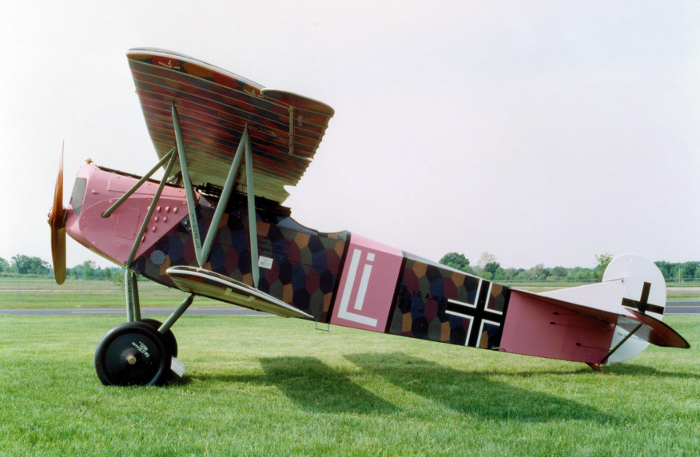 The Fokker D VII was without doubt the finest fighter placed in large-scale production and service by Germany in the course of World War I, and was arguably the best fighter produced by any of the combatants in that war if one makes allowance for the difficulties encountered by German industry in producing aircraft and engines in the closing stages of a lost war, and for the difficulties faced by the Imperial German army air service in operating a capable fighter with steadily declining quantities of increasingly indifferent fuel over the same period. The weights and performance of the D VII were thus very varied depending on a number of factors, but despite this and also the fact that the type was generally faced by Allied fighters with somewhat greater power available to them, the D VII nonetheless did more than just hold its own, and became so feared that it was the only German warplane specifically mentioned in the Armistice agreement that ended World War I in November 1918, when the Germans were instructed to hand over all surviving examples of the D VII. Moreover, the influence of the D VII lasted well beyond World War I for many examples were kept in service after the war and, more importantly, Allied assessments of the type’s technical features and operational capabilities had a considerable effect on the design of fighters into the middle of the 1920s, especially in the USA. 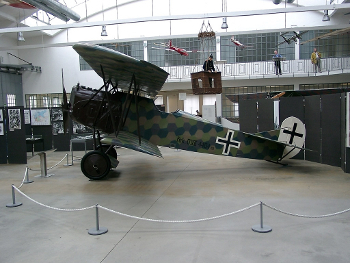 The origins of this seminally important fighter can be traced to the middle of 1917, when the German authorities announced that a major competition would be held at Adlershof near Berlin in January and February 1918 to find two types of new standard fighter for the Imperial German army air service, one of them with the well established Mercedes D.III water-cooled six-cylinder inline engine and the other with an air-cooled rotary engine of a type not yet specified, although the front runners were a pair of 11-cylinder units each rated at 160 hp (119 kW), namely the Oberursel Ur.III, which was preferred by Anthony Fokker as he had a major interest in the Oberursel company, and the Siemens-Halske Sh.III. The commercial as well as military importance of winning the competition were not lost on German manufacturers, and this resulted in a flurry of design and development effort by many German aero manufacturers including Fokker, which had fallen behind other companies in the securing of major fighter orders since its epoch-making E-category monoplanes and early ‘D’ category biplanes in 1915/16. The competition rules called for assessment of the aircraft (27 machines were ultimately submitted by 10 manufacturers for evaluation against four standard Albatros D Va fighters) in terms of their general flying characteristics, combat capabilities, manoeuvrability, diving qualities, pilot’s fields of vision, level speed at 16,405 ft (5000 m), and climb to 3,280 and 16,405 ft (1000 and 5000 m). Anthony Fokker entrusted to Reinhold Platz the task of creating the new fighter prototypes he intended to enter in the competition, and one of these was the aeroplane known to the company as the V.11, which was designed in parallel with the rotary-engined V.9 as a slightly enlarged development of this machine with the Mercedes D.III engine driving a two-blade propeller of the tractor type. Fokker decided to build two of these V.11 prototypes, and the first of these flew in December 1917 as a machine that was clearly of close relationship to the V.9 despite its inline- rather than rotary-engined powerplant and slightly less obvious features such as wings of greater chord (requiring the adoption of a two-spar structure for the lower wing in place of the V.9’s single-spar arrangement), N-type interplane struts in place of the V-type struts used in the V.9 but replaced by N-type struts in the D VI production model, and cabane arrangement of two tripod forward struts and two rear struts in place of the arrangement of four shorter tripods used in the V.9 but replaced by the V.11’s arrangement in the D VI production model. Initial trials of the V.11 revealed a number of poor features including poor directional and longitudinal stability that was improved by a lengthening of the rear fuselage by some 1 ft 3.75 in (0.40 m), the resulting rearward movement of the centre of gravity also requiring the rearward movement of the upper wing in a fashion that reduced the wing stagger and required the modification of the upper-wing centre section with a cut-out over the pilot’s cockpit. The V.11 was initially flown with the same type of tail unit as the V.9 (horizontal surface with horn-balanced elevators incorporated within its basically triangular shape and vertical surface comprising only a horn-balanced rudder of the ‘comma’ type) but was later revised with elevators whose balance areas broke the straight line of the leading edges and a new vertical surface with a small triangular fin carrying a horn-balanced rudder. In this revised form the V.9 emerged as the clear choice of the front-line pilots selected to undertake the flying elements of the trials, and the second V.9 was completed to this standard as what was in effect the production prototype of the type. As it had also demonstrated exceptional dogfighting capabilities, including excellent agility at high altitude, the ability to turn at high altitude without losing height and the facility to hang on its propeller while under full directional control, the V.9 was therefore ordered into large-scale production for service as the D VII. The required quantities were beyond Fokker’s capabilities, and it was a matter of great satisfaction to Anthony Fokker that his company’s main rival in the design and manufacture of advanced fighters, namely the Albatros Werke G.m.b.H., was ordered to produce the D VII at both its main plant and also in that of its Ostdeutsche Albatros Werke subsidiary. The front-line pilots did have a number of criticisms of the V.9, it should be noted, and these included too great a structure weight, slightly inadequate performance at high altitude, and climb performance that was not as good as the pilots would have liked: the pilots therefore recommended that the D VII production model should have the new BMW IIIa water-cooled six-cylinder inline engine rated at 185 hp (138 kW) but, as the Inspektion der Fliegertruppen (inspectorate of flying troops) pointed out, this new engine was still under final development and would not be available for some six months and that the D VII would have to make do in the short term with the Mercedes engine. This provided adequate performance at medium altitudes and, as had often been pointed out by front-line pilots, this was generally preferable to an exceptional climb capability. The D VII was an unequal-span biplane typical of Platz’s overall design philosophy as modified to create a biplane rather than monoplane type and as adapted to the availability of current material and production resources. The aeroplane was therefore based on a mixed structure (welded steel tube for the fuselage and tail unit, and wood and plywood for the wings) covered largely with fabric, and a wing cellule based on Platz’s firm belief in the superiority of thick-section wings for great strength in combination with high lift at the moderate speeds of the day. The aeroplane was based on a fuselage of welded steel tube construction. This fuselage was of rectangular section with a rounded upper decking and carried, from front to rear, the powerplant, fuel and oil tanks, open cockpit, and tail unit. This last was of fabric-covered welded steel tube construction and comprised single horizontal and vertical surfaces: the former included a large tailplane with acutely swept leading edges and a single strut on each side bracing it to the relevant lower longeron, and this carried the plain elevators; and the latter included a triangular fin carrying a horn-balanced rudder that was hinged at its lower end to the vertical knife-edge in which the fuselage terminated. The staggered semi-cantilever wing cellule was of fabric-covered plywood and wood construction with a covering of fabric except over the plywood-covered leading edge, and comprised a larger upper wing and smaller lower wing each of constant chord but tapering thickness to its slightly rounded tips; large horn-balanced ailerons were installed on the outboard ends of only the upper wing’s trailing edge. Both surfaces were flat and built as single units of the cantilever type: the lower wing extended from the fuselage in line with the lower longerons, while the upper wing had a shallow cut-out in its trailing edge above the cockpit and was carried above the fuselage by a cabane arrangement comprising two tripods at the front and two single struts at the rear. The upper and lower wings were separated on each side by a single set of N-type interplane struts that obviated the need for incidence-bracing wires, and there were no flying or landing wires. The airframe was completed by the landing gear, which was of the fixed tailskid type with a main unit of the through-axle type in which the two-wheel axle was bungee-bound into a spreader bar arrangement faired to an aerofoil section with plywood and carried at the closed ends of two wire-braced V-type struts extending downward and outward from the lower longerons. As noted above, the powerplant was based on one Mercedes D.III engine: this was installed at the front of the fuselage inside a louvred light alloy cowling that left only the top of the cylinder bank exposed, drove a two-blade wooden propeller of the tractor type, discharged its spent gases to starboard via a simple manifold, and was cooled by a frontal radiator with angled-back side elements. Deliveries of the D VII began in April 1918, and the first unit to receive the new fighter was Jagdgeschwader 1 commanded by Rittmeister Manfred Freiherr von Richthofen and comprising Jagdstaffeln 4, 6, 10 and 11. The fighter was then used to re-equip as many fighter units as possible including JG 2 (Jastas 12, 13, 15 and 19) and JG 3 (Jastas 2, 26, 27 and 36) as well as the independent Jastas 5, 7, 8, 14, 16, 17, 20, 22, 23, 24, 28, 29, 30, 32, 35, 37, 40, 44, 46, 47, 48, 49, 51, 52, 53, 54, 56, 57, 58, 59, 66, 69, 71, 74, 79 and 80. From May 1918 the D VIIF became available as the variant of the D VII with the BMW IIIa engine, and this model offered performance so much improved over that of the basic D VII, especially in climb and performance at medium and high altitudes, that demand soon outstripped supply and the aircraft became the mounts mainly of the most experienced and successful pilots. Production of the D VII was still under way at the end of the war, when the German fighter squadrons had about 775 of the type in service out of the total of about 1,750 aircraft that had been delivered by Fokker (861 machines) and the two Albatros companies (at least the same number again). The type had also recently entered production for the Imperial Austro-Hungarian army air service at the MAG plant in Hungary, where some 50 aircraft were completed up to 1919 with the revised powerplant of one Austro-Daimler water-cooled six-cylinder inline engine rated at 210 hp (156.5 kW). Experimental and developmental variants of the D VII were numerous. The V.18 was produced at the same time as the two V.11 prototypes and had a long-chord fin with a curved leading edge. The V.21 was a development with tapered wing panels and was flown in the second ‘D’ category fighter competition of May and June 1918. The V.22 was the definitive pre-production prototype of the D VII with all the best features of the V.11, V.18 and V.21. The V.23 was a version of the V.22 with constant-chord wing panels. The V.24 was an experimental development of the D VII with the powerplant of one Benz Bz.IVü water-cooled six-cylinder inline engine rated at 240 hp (179 kW) and flown in the second ‘D’ category trials. The V.29 was an experimental parasol-wing development of the D VIIF for participation in the third ‘D’ category trials of October 1918. The V.31 was a D VII fitted with a hook to tow the V.30 glider using D VIII parasol-wing fighter components. The V.34 was a D VIIF with a revised tail unit. The V.36 was a development of the V.34, and of the two such aircraft the first had the same type of tail unit as the D VII and the second had a fuel tank in the spreader bar fairing and no cut-out in the upper-wing trailing edge. The V.38 was a two-seat development of the D VII for the reconnaissance fighter role and was placed in unofficial production as the C I that became the C.I after the war. After the Armistice, Anthony Fokker managed to escape to his native Netherlands with large amounts of money as well as much matériel and many aircraft including components for some 150 examples of the D VII of which 148 were then assembled and sold to the USSR (50 aircraft) and the Netherlands (98 aircraft), for which the type served in the Netherlands army air service (72 machines), Netherlands navy air service (20 machines) and Netherlands East Indies army air service (six machines). Fokker restarted production of the D VII in the Netherlands, and a limited number of aircraft from this source were sold to Denmark, Finland, Poland, Romania and Sweden. Although the Armistice agreement had specified that all D VII fighters were to be handed over to the Allies, many German squadrons destroyed their aircraft while a number of pilots flew their aircraft to neutral countries such as Denmark, the Netherlands, Sweden and Switzerland. Of the D VII fighters actually delivered to the Allies, numbers were handed over to Belgium, Italy and the USA. Within a total of 324 ex-German aircraft handed over to Belgium were 75 examples of the D VII, of which 35 were taken into Belgian service as fighters that later became advanced trainers in the later stages of their career into 1931. Italy used its aircraft only for trials purposes, some of them revised with a water-cooled six-cylinder inline powerplant of one BMW unit rated at 250 hp (186 kW) or one Siddeley Puma unit rated at 230 hp (171.5 kW). Some 142 D VII fighters were included in the total of 347 captured aircraft shipped to the USA, where a number entered limited service for operational or evaluation purposes. Switzerland bought 10 aircraft (eight D VII and two D VIIF fighters) from the Allied Control Commission after the war, and the Alfred Comte Flugzeugfabrik then built an additional eight aircraft.